The Wildland Firefighter Apprenticeship Program is an educational program designed to enhance and develop future Fire and Aviation Managers. The intent of the Program is to take a career entry firefighter and provide education, training and paid work experience over a 12 to 48 month period, depending on experience. 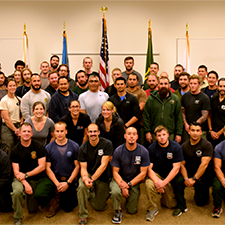 Upon successful completion of all the requirements of the Apprenticeship Program, the apprentice will reach journey-level status as a wildland firefighter. Want to find out how to become an Apprentice? Our four Jon Kelso Leadership Award winners from this year will be traveling to Colorado next month to participate in the South Canyon Staff Ride. Read about the experience from our two award winners from last year Adriel Apter and Freddie Hernandez. We are currently working on a contract for satellite academy deliveries in SE and hope to have it awarded by mid-summer. Curriculum for the FY20 season has been approved. Take a look here to see what is ahead for next academy season. Pre-work for the next Academy season should be posted by mid-summer and will be hosted on the Learning Portal... more to come.